What you need to remember is that this is no ordinary burner, this one supports burning to Blu-ray discs. 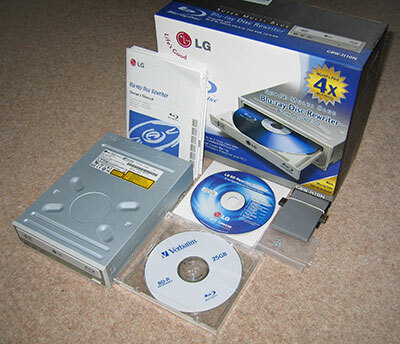 Where a normal DVD burner might support your typical 4.37GB single layer and 8.5GB double layer discs, the Blu-ray single layer discs are 25GB! That extra space is what makes this newer 'High Definition' format so good. If you think DVD's look excellent on your shiny new 46" HD TV, you haven't seen anything yet! 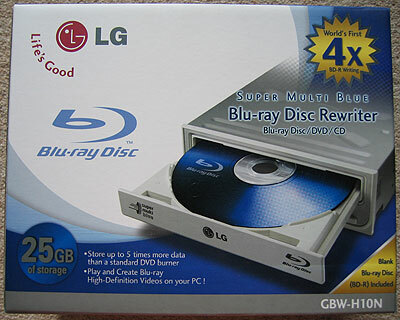 Blu-ray enables the movie publishers to take picture and sound quality to a whole new level. SVP Communications very kindly lent me this drive so I could get ImgBurn v2.2.0.0 working with Blu-ray drives / media properly. I would like to start by saying a big 'Thank You' to them! The drive was supplied as a retail boxed item. 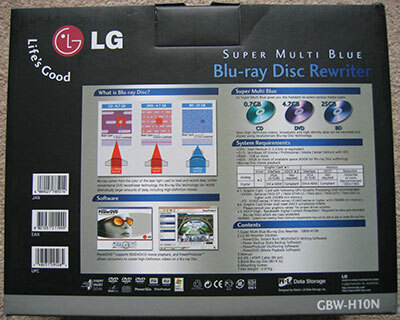 With the price of BD-R and BD-RE discs being about equal (roughly £10 a disc), I fail to see why LG bundled a BD-R rather than a BD-RE. I think people would find the BD-RE much more useful, but perhaps that's just me? Having removed everything from the box, the first thing that struck me was the size of this drive... it's huge! DVD writers have been getting smaller and smaller and this new LG model is a good inch longer than the others in my case. That's a bit of a pain if you've got A/C Ryan cables (which I do) because they simply won't reach.